We are four weeks into 2017 Africa Gold Cup and the story is taking shape as far as next year’s World Cup qualifiers are concerned. We have seen fantastic performances from various teams as well as brilliant personal moments from talented individuals across the top tier Africa Rugby action. Week one of the Gold Cup saw Uganda fight hard in Nairobi to draw 33-33 and it was actually the home side, Kenya, that looked like the under dogs getting the final seven points through a penalty try. After gaining promotion from Silver Cup, Senegal hoped they would get things going on day one but Zimbabwe beat them 28-16 at home. They, however, had a good performance getting a point in their 16-17 loss to Uganda the following week. Tunisia, who had been relegated but came back after the expansion of the Gold Cup, kicked off their campaign with a home clash against defending champions Namibia who thrashed them 53-7. The North Africans have not had a good day in the Gold Cup as they have conceded 231 points in three matches after 100-10 defeat to Kenya and a 78-17 defeat to Uganda. Uganda seems to be getting their cards right but their real test will come in the last two rounds of the game. After drawing 33-33 in Nairobi, the Cranes beat Senegal 17-16 and Tunisia 78-17 to remain firmly in the competition. Kenya struggled against Uganda with their head coach Jerome Paarwater blaming is defence after every match even in matches against Tunisia and Senegal where they won 100-10 and 45-25. Against Tunisia, they conceded two tries while Senegal had three tries against them. Namibia are obviously one of the favorites but had their waters tested by Zimbabwe as they trailed 20-7 at the break before returning to win 31-26. This sent a big message across Africa that they are actually beatable, again. Zimbabwe have only played two matches which have not convinced everyone on where they truly stand. They struggled to beat Senegal 28-16 and let an half-time lead slip against Namibia. After Saturday, July 15, Namibia lead the log with 15 points, Kenya is second with 12, Uganda are third with 11, Zimbabwe sit fourth with six, Senegal are fifth with 1 point while Tunisia are sixth with no point. We still have three rounds of matches to go. On Saturday July 22 we have two matches where Zimbabwe will host Kenya and Namibia travel to Uganda. This will be a ‘Super Saturday’ as results of the day will completely change the standings. Kenya bagged a win in Harare in 2016 and the Simbas have their heads high to win again but the Sables want to take part in next year’s World Cup qualifiers. Kenya seeks a win to keep Namibia on their toes while Zimbabwe looks to cement their place above the relegation position while catching up with Uganda. 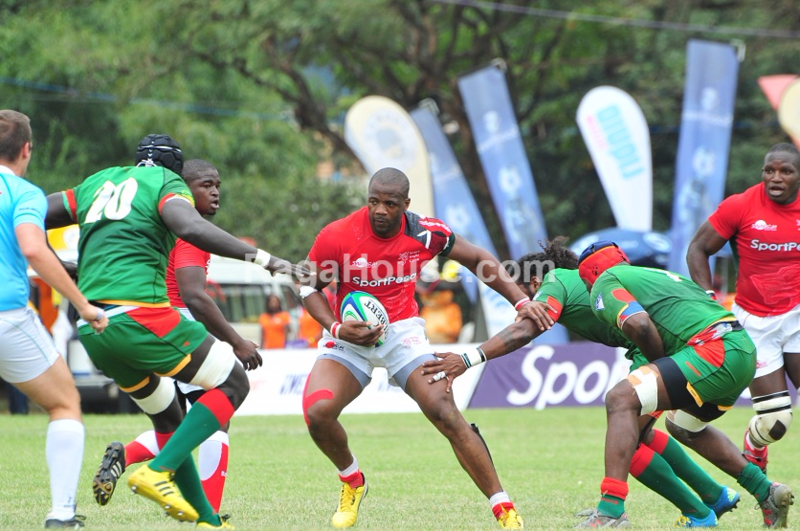 The second match, featuring Uganda and Namibia, promises fireworks at Legends Rugby grounds. This fixture last year ended 40-31 to Namibia with Uganda becoming the only side to really challenge Namibia. The Ugandans are looking stronger more than before and Namibia’s match against Zimbabwe, which the Cranes watched, gave the Kampala boys more hopes. Asuman Mugerwa, Brian Odongo, Pius Ogena, Lawrence Sebuliba and Kenyan based duo of Philip Wokorach and James Odong are the backbone of Uganda Cranes. Saturday, July 29 also has two matches, Zimbabwe hosting Tunisia and the latter’s captain has been quoted saying they must win against Zimbabwe and Senegal. Let’s wait. Namibia will then host Kenya with all eyes being on Jerome Paarwater coached Kenya as they seek a win over a team that has remained their biggest problem in Africa. Africa Gold Cup will conclude on Saturday, August 5 when Uganda will host Zimbabwe while the second match will be a basement battle between Senegal and Tunisia in Tunis. As the Cup continues, Kenya’s Darwin Mukidza is the top point scorer with 63, Uganda’s Philip Wokorach is second with 56 while Namibia’s Rohan Kitshoff is third with 30 points. Zimbabwean Takudza Kumandiza is seventh with 20 points. Top try scorer is Kitshoff with six touch downs while Kenyan duo of Mukidza and Jacob Ojee have five tries. Lastly, the partnership between Rugby Afrique and Kwese Sports has seen all matches available on TV making the tournament even great across Africa and in the World of Rugby.